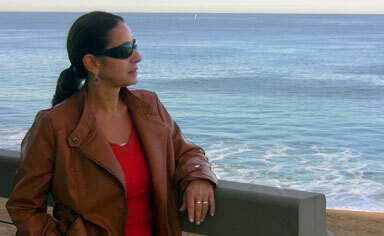 Dr. Adina Paytan is a Research Scientist at the University of California, Santa Cruz. The Paytan Biogeochemistry Lab is a part of the Institute of Marine Science and the Departments of Earth and Planetary Sciences and Ocean Sciences. Her group's primary research interests lie in the fields of biogeochemistry, chemical oceanography and paleoceanography, with a particular interest in phosphorus sources and cycling. One of the many unique things about Adina - among them spending two years in the Israeli army, and spending another two years hiking in the Himalayas - is that, in addition to her scientific degrees, she has a Master's degree in Science Education. If nothing else, the effort she spent to get that degree proves her dedication to making sure that outreach is part of her life. She devotes time to developing and implementing programs that enhance the process of learning science, expose students at all levels to the excitement of doing science, and introduce the relevance of science to real-world problems and current issues. She also devotes time to mentoring her students - of all ages - and provides a real-world model of how to combine science and outreach, research and family life. "I believe the role of the scientist is not only to do research but to be able to communicate their research to the general public, and that includes a population of all ages, from kindergarteners to my grandma." Marine biogeochemistry is interdisciplinary; it requires understanding geological, chemical, physical and biological processes and the complex interaction among these processes. Most of the research projects in Adina's laboratory involve collaborations with a wide range of experts and incorporate a diverse set of analytical tools and research approaches. "Doing outreach impacts the quality of my science," says Adina. "It makes me think of problems that are relevant for society, such that I can talk about them to everybody else and say what is it that scientists do that is important for this planet." Photographs and images for Adina's pages courtesy of Adina Paytan and COSEE California.